October’s meeting of the SAND Action Group was as fruitful as ever. We are starting to make sense of all the various contacts that we each have and intend to explore these and draw them together at our Away Day in November. We are keen to work out how we can best talk to Junior GPs and social workers as well as residential care staff and domiciliary workers. Immediately after our meeting a couple of us went and delivered a presentation to the Shropshire Solicitors for the Elderly Network – about 30 people turned up to hear us give a slightly revised, audience-targeted presentation. We were pleased to receive this email afterwards: Thank you both for the excellent presentation you gave this afternoon. It was superb and much appreciated by all. As we talk to more and more people we are still experiencing the ‘we treat everyone the same’ mantra which is a very effective block to actually listening, thinking and changing practices. We need to work on effective resp onses to this to complement the fantastic graphic that we currently use (see left). We have recently produced a short fact-sheet called ‘It’s Not About Me’* – the title is a wow-moment quote from one of the care workers we spoke to who suddenly realised that we were talking about the individual LGBT person’s own experiences and life-story impacting on their ability to share and be comfortable and fit in – rather than accusing the care worker of working in discriminatory ways! We had a similar conversation with the Solicitors for the Elderly when we are asked if we really believed that people want to be treated differently. When we used the image above to respond to the question, saying that we are talking about how to achieve equality of experience/outcome rather than equality of the way we work with people, it became apparent that we use the language of equalities quite loosely which could be improved. We were also challenged about the difference between LGBT people’s experiences and those of heterosexual people. For example, whilst many LGBT people have not made wills neither have many straight people. The difference for us is the reasons why which may require different responses – so, if gay men are not approaching solicitors because of an historically fuelled fear of professionals (remember those in later life now were in their 20s and 30s when homosexuality was illegal and gay men were frequently persecuted by the police and authorities) then this can surely be addressed by targeted outreach and positive images. We continue to plough on and find different ways of explaining what the issues are and helping people to understand and change the ways that they work. Meantime we are planning some fun! On Saturday 29th November, SAND will be holding a 70s disco and auction fundraiser. It should be a great night with authentic disco playing on real vinyl, great curry at a great price and a plethora of fantastic auction items – we are adding to the list all the time – check out our auction page and don’t forget to check back from time to time. We are encouraging people to dress up and boogie down. Tickets are available in advance from SAND, Pengwern Books and Age UK Shropshire Telford & Wrekin. There will also be some on the door. Planning events is one thing – we are also continuing to brush up the SAND Action Plan. Having come up with some ideas for our Outcome Two: Empowered organisations at the last meeting we revisited what we’d said in order to fill some gaps and then moved onto our Third Outcome: Influencing Policy which is proving to be quite a tricky one to plan as it is so much easier to slip back into actions which are directly about people (Outcome one) or Organisations (Outcome two). We did it though – realising that our starting point should be to look at what already exists and then look at developing some model policies – should keep us busy! Finally, we are still making movement towards becoming a real social enterprise (whatever that means) – keep watching this space! It is a slow process because we want to get it right. After much humming and hawwing and lots of advice we have plumped for a Company Ltd by Guarantee (with asset lock) structure and are grateful to UnLtd Care for the help to get to this point. * We will make this and other fact sheets available once they have been fed back to the people taking part in the research. 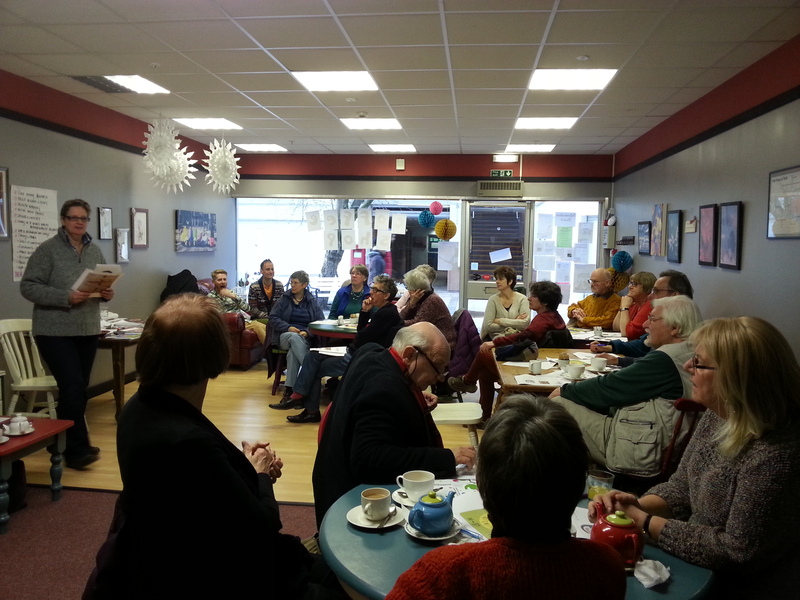 August holidays didn’t deter the Action Group from gathering in good numbers for our monthly meeting. This regular meeting – every month on the same day, at the same time for 2.5 hours really seems to work to keep things flowing and interest high. 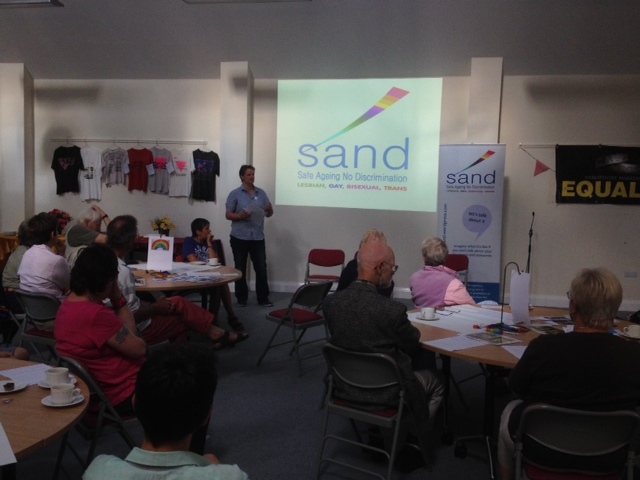 We are achieving a nice balance of business – keeping SAND going in a practical sense; fun – with ideas for fundraising and networking; and research & delivery with presentations proving quite popular. Business: we have finally decided on a ‘business model’ to suit SAND designs to operate as a Social Enterprise. We shall be registering as a Company Limited by Guarantee with an asset lock. We have also submitted a couple of small funding bids – we are still not interested in sending in anything too large as it feels like this would sway the variety and flexible work we are currently doing and would drive us down a singular route. We are also now welcoming donations from supportive individuals – big thanks to all those who have contributed so far. In this way, we are keeping vibrant, creative and visionary. Where to go for funding inevitably introduces the question of ethics – who do we not want money from and how do we agree? That is one of the questions we’ll be pursuing at our Action Group Away Day in November. Fun: ideas include Open Gardens; Progressive Dinners and yes – the cheesy 70s fundraising disco is back on the agenda so put 29th November 2014 in your diaries for a night out in Shrewsbury! We also have some ideas about trips out of County to meet others working in similar fields. Research & delivery: We are busy with the HealthWatch funded research with LGBT people over the age of 50. We are now doing face-to-face interviews over a cup of tea – a much improved approach compared with an online survey. The information we are getting is rich and fascinating. We have about 20 people so far engaged and others in Shropshire are welcome to join in – please contact us: lgbtsand[@]gmail.com (remove the brackets in the middle!). We are also delivering presentations/facilitating discussion with different groups – our next will be the entire staff team in a residential care home – we are doing 2 sessions so we can talk to them all in shifts and then we are off to Newcastle On Tyne where we have been invited to run a workshop at a National Conference. Nb. We need to charge a small amount to keep SAND afloat, so presentations are now £100 a pop. The dynamism of SAND comes from its ability to be flexible, responsive, broad-thinking and creative. We are still musing about the best structure for SAND to keep all these positives intact whilst giving us a business model to ensure the work progresses and survives. This looks increasingly like something in the Social Enterprise world so this is what we are focusing on. There still doesn’t seem to be any particular rush – in fact it is interesting to take the pressure off and watch the organic development, but we do need to collect the information and have the ideas and understanding of what we might need to do to make it happen when the time comes. More people are slowly getting involved and this gentle ‘boil’ seem to really work in terms of buy-in. A local network is organising some fundraising (and perhaps more importantly awareness/knowledge raising) events which, it is hoped will involve 20-30 people; we are planning a ‘launch’ event in July for the local LGBT community, friends and allies which we hope will attract 50-ish people. Of course, the SAND HealthWatch-funded research is about to get underway – we have designed and printed some publicity and will initially be piloting the questions with a small group. Easter has arrived slap bang in the middle of the design/pilot so we’ll work with the timescale to get the best return we can once we get the publicity out and about. This research is very much a project – just one aspect of SAND’s work and – as it is the only bit that is funded – we are aware that we need to keep an eye on the ball to ensure a balance is kept. We have just developed a ‘volunteer hours log’ so we can capture all the time that is given to SAND in addition to the funded work – we started the log at the beginning of the financial year to keep it in line with accounts for future funding bids. We are delighted by the uptake of – and interest in – the SAND presentation which is coming from different quarters including Universities and Solicitors for the Elderly. This feels like a great step forward and we are looking forward to developing it further. This must become an income stream for SAND so we do need to charge – but only £50 a pop and, if people really can’t afford that we could perhaps go lower or talk about in-kind exchange. Publicity is a big thing and we are working hard on ‘branding’ which might sound a bit private sector but we want people to recognise SAND at a glance – at some point in the future we may have some sort of SAND-stamp so let’s start that thinking now and have a strong image. 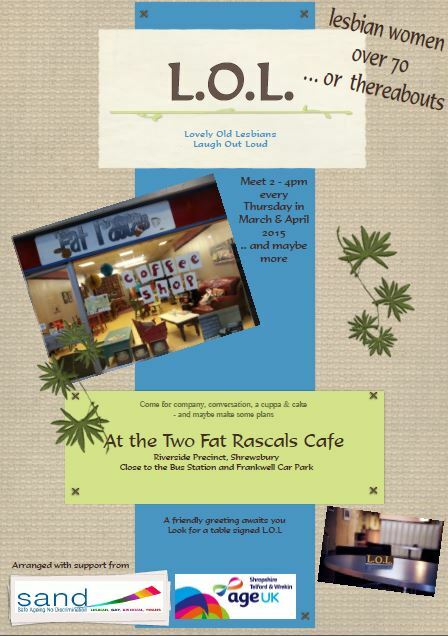 It looks like we have secured a bit of money for banners and promotional material so the work starts here! As part of that we are thinking about having some representation at the Shrewsbury Carnival – Out and Proud, being seen – all that …. at the moment the only thing in the way of that is capacity and this is a classic case of asking others to carry a banner – we’ll see if we manage that one.